What started out as a cold snowy January morning quickly transformed into a beautiful albeit brief and sunny morning at Dream Lake. When I first arrived at the Bear Lake trailhead in the early morning hours, fog was drifting through the pines and snow was falling. Chances of seeing the sun this morning seemed minute but the fog and snow would still make for a breathtaking landscape. 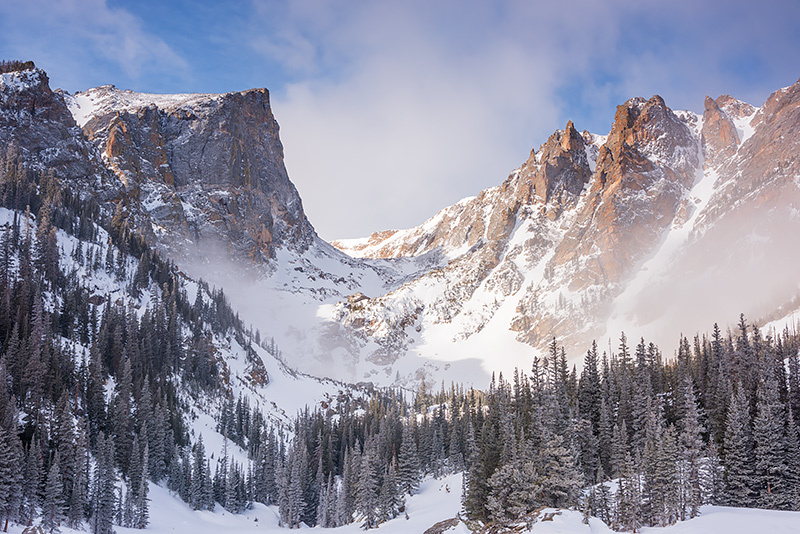 I snowshoed up to Dream Lake in the snow and fog and waited for the skies to lighten as the sun rose. I spent an hour or so photgraphing the frozen trees and lake. In between photographing the beautiful frozen tree's I looked up only to see the clouds clearing and Hallett Peak and Flattop Mountain making a quick appearance. I quickly reset my camera and made a handful of exposures of the sun lit peaks before the clouds moved back in once again obscuring Hallett Peak and Flattop Mountain. Photo © copyright by Thomas Mangan.